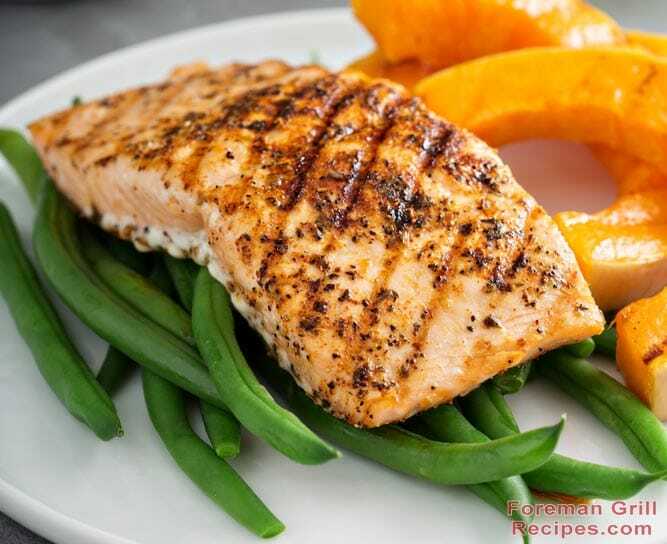 One of the easiest and healthiest foods you can prepare on your Foreman Grill is salmon. Salmon is among the most nutritious foods on the planet! It’s not just because of its high Omega-3 content, but it’s also packed with tons of other vitamins and minerals. If you don’t have much time and still want something delicious and healthy, then this is your go-to salmon recipe. First warm up your Foreman Grill for about 5 minutes with lid closed. Use the high settings if your grill has the temperature controls. Now dry rub your salmon on one side. You don’t need any oils or butter. You can use pretty much any seasoning you like. Personally I prefer cajun seasoning. Cajun blackened salmon is just the best. If it’s too spicy for your kids, then garlic salt and lemon pepper will be a good choice. Next place your salmon on the grill with the spiced side down. When it’s on the grill, rub the seasoning on the other side of the salmon. Try not to burn your hands. Close the lid and let it cook. Good time for salmon fillet is 3-4 minutes and salmon steak 6-8 minutes. I suggest you to cook for the minimum time first and then start to check the salmon for readiness. Salmon fillet is done when it turns opaque and flakes when you stick it with a fork. Enjoy your perfectly blackened salmon! I WANT to cook on a gas grill.? ANY suggestions? Ask about cooking on a gas grill on a different website. This one, quite obviously, is dedicated to use of the George Foreman Grill. The recipe is absolutely fantastic on a GF grill.